The Nikon D5100 takes solid photos and videos, offering the response shutterbugs demand as they move from point-and-shoots to “real” cameras. There’s no question the economy is tough, but it’s hardly curtailing the lust for DSLRs—especially the newest Nikons. The company is practically selling all they make, but we finally got our hands on one of the biggest sellers. Now let’s see if it’s worth the hype. The 16.2-megapixel Nikon D5100 has the classic look of almost all sub-$1,000 DSLRs. It’s big and bulky thanks primarily to the lens mount and mirror assembly (that’s why mirror-less cameras like the Olympus PEN and Sony NEX series are so cute and cuddly). Although the D5100 is large (5 x 3.8 x 3.1, W x H x D, in inches) and weighs 19.7 ounces for the body alone, the camera has a bit of a plastic feel. Forget the hefty magnesium-alloy frames found on more enthusiast-oriented models like the 24.3-ounce (body only) 16.2-megapixel Nikon D7000, one of our favorite new cameras. That one sets you back $1,199 without a lens, so it’s really in another league. The D5100 looks very much like the 12.3-megapixel D5000 it replaced, leaving few surprises for camera geeks. The real changes are inside and on the back. Naturally, this DSLR has a Nikon F bayonet lens mount; it works best with AF-S glass, and there are 44 lenses to choose from. Also on the front is an AF Assist lamp, remote sensor in the grip, mono mic for the HD videos, and lens release button. You’ll also see the red Nikon swoosh logo and some low-key text. They’re subtle and relatively sedate. On the top is a five-pinhole speaker, hot shoe, auto pop-up flash and the critical mode dial. Next to it is a lever to engage Live View for framing images through the LCD screen and to prep the camera for shooting video. Clustered behind the angled shutter are three buttons: red-dot for video, Information (I) to quickly check your settings, and exposure compensation. The mode dial is pretty straightforward with auto, PSAM, flash off, scene (11 options) plus five popular scene modes (portrait, landscape, kids, sports and macro) you can access directly. The effects setting is new. Here you have five filters that add an “artistic” touch to your photos. Whether you think the Color Sketch choice is art or trash is ultimately your call, but we found them fun in a warped way. 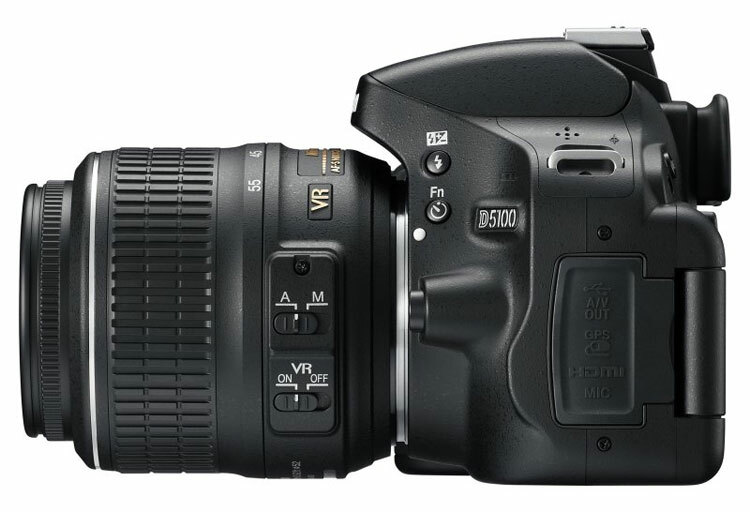 When you check out the back, you’ll see one of the biggest changes, vis a vis the D5000. The new camera has a 3-inch vari-angle screen with a hinge on the left. This rotates in a variety of angles so you can take self portraits, hold the camera over your head or at waist level. You really won’t be doing too much one-handed shooting, but it opens up a world of options. The discontinued D5000 had a 2.7-inch screen that just moved out, up and down. The new one is much better, and is rated 921K pixels, a good spec. The D5100’s LCD practically makes it a direct competitor to the Canon EOS T3i, with its 3-inch, 1.04-megapixel vari-angle screen. We really liked this 18-megapixel DSLR and gave it an Editor’s Choice award earlier this year. Because the LCD is hinged on the left, Nikon had to drop some buttons you’ll typically find on DSLRs, such as White Balance, ISO and resolution. This clearly puts the camera in the casual shooter’s camp, as enthusiasts typically want to tweak these settings on the fly rather than walking through a menu system. It’s not a deal breaker, just something to be aware of. 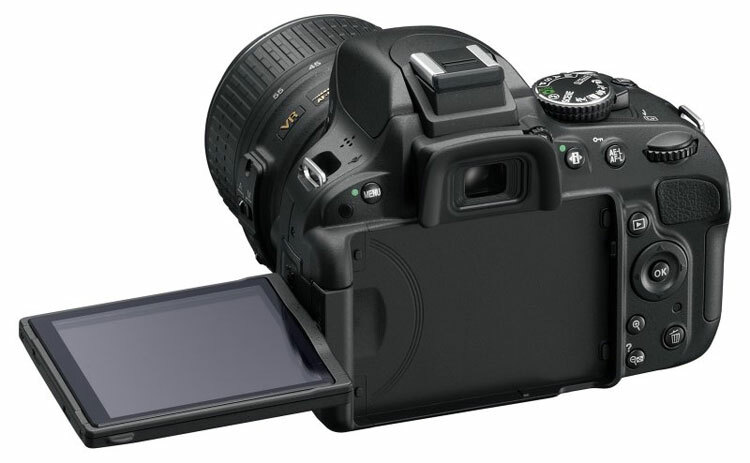 The more expensive Nikon D7000 still has them, since its LCD is more centered and in fixed position. The buttons you will find include menu, information edit to change your settings, AE-L/AF-L, playback, enlarge, reduce and delete. You’ll also find a jog wheel and four-way controller with center OK button for moving through the menus and making adjustments. Since this DSLR is targeted to casual shooters, there are on-screen captions explaining the various settings as well as thumbnail examples. It’s very nicely done, and is a great help for those moving into DSLR territory for the first time. In the top right is a textured thumb rest to help keep the camera steady. Although this camera has Live View for framing subjects on the LCD, most of time you’ll use the viewfinder as you hold the D5100 to your face. A nice rubber eyecup makes this move safe and comfortable, while the diopter lets you sharpen it for your eyesight. The viewfinder offers 95-percent field of view and .78x magnification. It’s far from the biggest or brightest we’ve ever used. That said, the T3i is similar, but the D7000 offers 100-percent coverage. On the right side is a slot for SDHC/SDXC media; the camera handles Eye-Fi cards too. You should use an 8GB card rated at least Class 6. On the left is a compartment with mini HDMI out, USB/A/V out and a GPS input. Also nearby are self-timer/function and flash-open buttons. The bottom of the made-in-Thailand DSLR has a metal tripod mount and the battery compartment. The supplied power source is good for 660 shots, per CIPA. This is a solid figure and — unless you go video crazy — it should last for a full day’s shooting and more. The D5100 kit comes with the camera body and an 18-55mm stabilized zoom. This lens is decent for starting out, but it’s very limited. We were dying for more reach; more on that in a bit. You also get a rechargeable lithium-ion battery, plug-in QuickCharger, eyepiece cap, rubber eyecup, USB and A/V cables, strap, LCD monitor cover, body cap and accessory shoe cover. Nikon supplies a nice printed user’s manual (82 pages in English) as well as quick start guide. There are two CD-ROMs: One has ViewNX 2 software for handling images and developing RAW files, the other has the complete reference manual. With the battery charged and an 8GB Class 10 card in place, it was time to give the D5100 a workout. We had the Nikon D5100 outfitted with the 18-55mm kit lens for several weeks, taking it to baseball games, shooting around New Jersey and on several trips into New York City. Resolution was set to JPEG Fine or RAW+JPEG. In the case of a 16.2-megapixel CMOS sensor camera, that means you’re capturing 4928 x 3264 files. Videos were shot at 1920 x 1080 at 30fps in the MOV format. 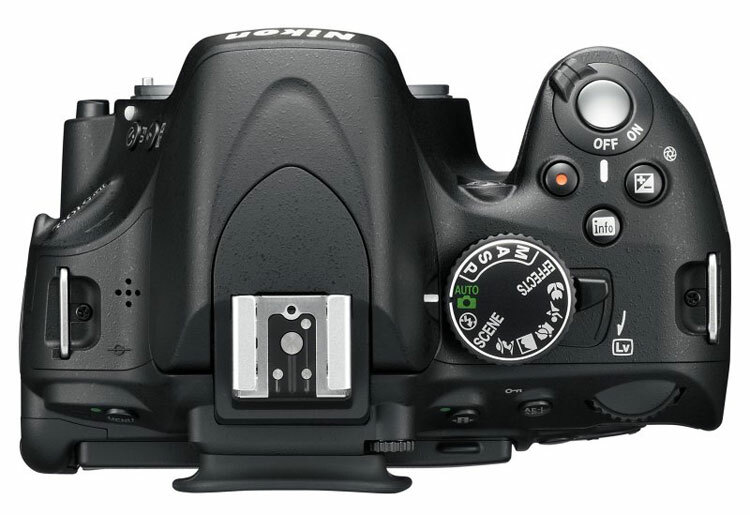 Before opening the envelope for the results, we’ll state the Nikon D5100 is relatively easy to use once you realize the information edit button gives access to key adjustable parameters. The four-way controller then lets you choose specific options. In other instances, the jog wheel makes the adjustments (such as scene modes). It’s a bit awkward, but something you’ll master in no time. The camera focuses very quickly thanks to an 11-point AF system (the T3i is 9-point). Both have one cross-type sensor. We hate to keep saying it, but the D7000 has 39 points/9 cross type. The D5100 is also quite responsive at 4 frames per second (the Canon T3i hits 3.7fps, D7000 6fps). As noted, the D5100 kit has an 18-55mm lens, which equates to a 27-82.5mm 35mm equivalent. This is very limiting, as we discovered sitting in nosebleed seats at CitiField during a Mets baseball game. Although the wide-angle view of the stadium was good, trying to zero in on the players running the bases was a losing proposition. Having the Nikon P500 with its 36x zoom at the ready would’ve made watching the Mets lose again more palatable. In other words, definitely prepare to invest lots more money for additional glass if you buy this camera. Oh, for general snapshots and DSLR newbies, this 3x lens is OK, but that’s about as far as we would go. And better lenses would be a worthwhile investment, since the basic engine of the 16.2-megapixel D5100 is very good. After reviewing hundreds of images, we found the colors very accurate with nice reds, solid greens, good whites and yellows. Anyone taking snapshots in auto will be happy with the results. While auto is a good default, it would be a shame limiting yourself to this “green” setting. Once you get the hang of the controls, this camera was meant for exploration — no matter if it’s exposure compensation, white balance, ISO and lots more. Speaking of sensitivity, one of the key differences between point-and-shoots with small sensors and DSLRs with their larger APS-C imagers is ISO. Typical aim-and-forget cameras may be rated 1600 or 3200, but they start falling apart at ISO 400. The D5100 has a native range of 100 to 6400, but if you choose Hi-1 and Hi-2, you reach 12,800 and 25,600, respectively. In theory you should be able to shoot a black cat snoozing in a dim room. Alas, theory and reality are quite different. We actually tried photographing a flower arrangement in practically a mineshaft-dark room. Without a contrast edge to focus on, the shutter wouldn’t fire. Adding a small candle a few feet away so the D5100 could fire, we took a number of shots at ISO 25,600. Although the results look like something out a French Impressionist exhibition, it was amazing the camera captured anything at all. This was mind blowing. Realistically you can shoot at ISO 6400 without the images falling apart which is quite impressive. That said, if you want larger prints, stay below ISO 1600. We had to try the filters, which are something of a burgeoning trend thanks to the yeoman efforts of Olympus with their Art Filters. We think things like “miniature effect” and “night vision” are kind of dumb, but “color sketch” might be useful to some. 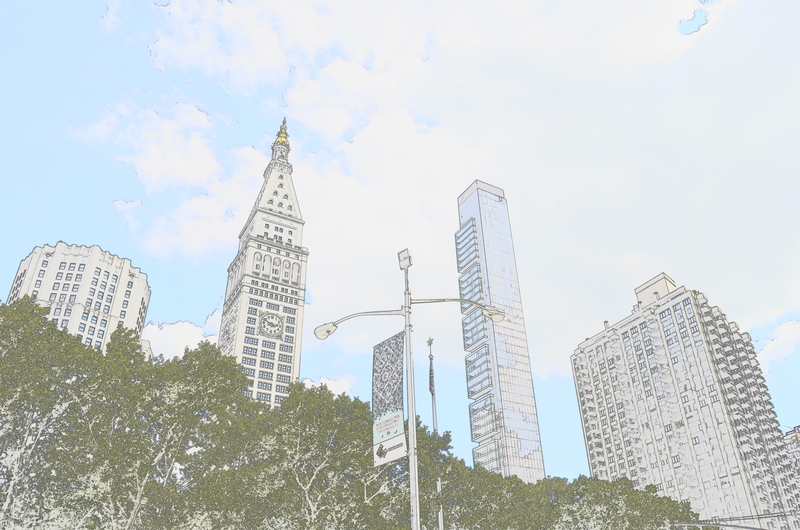 We used it for the buildings surrounding Madison Square Park near the Flatiron Building in NYC. Beauty is in the beholder, and we’ll leave it at that. Naturally, the Nikon D5100 takes full HD videos (1920 x 1080 at 30fps). For short clips of fairly static subjects, the results are decent, but hardly camcorder level. The Sony SLT-A55V still reins supreme if you’re looking for top-notch video from a DSLR. That said, quality has come a long way from the early days of the Nikon D90 (720p at 24fps). The movies we recorded had good colors and were fluid with few compression artifacts. If you’re in the market for a new DSLR you can hardly wrong with the Nikon D5100. It takes solid photos and videos, offering the response shutterbugs demand as they move from point-and-shoots to “real” cameras. 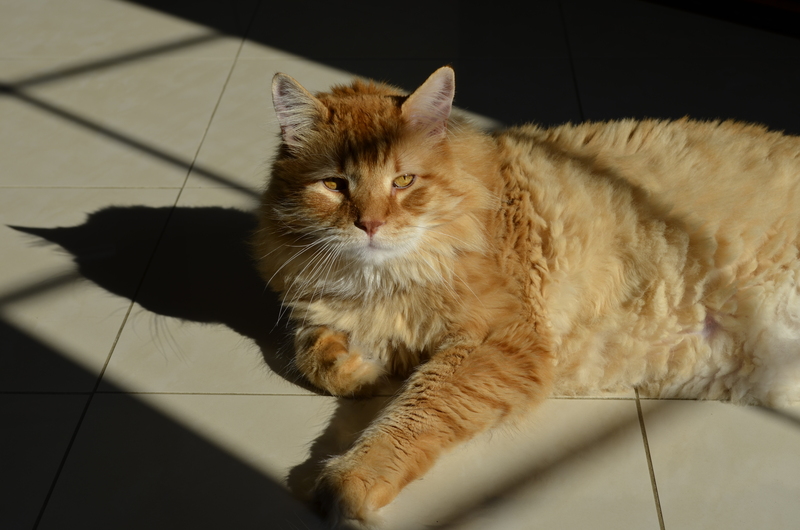 We weren’t too thrilled with the kit lens, however. It’s an OK starting point but get ready — you’ll soon realize it really doesn’t serve the camera well. When that happens, you’ll end up tapping the credit line for more glass. That’s part of the “fun” of owning a DSLR.